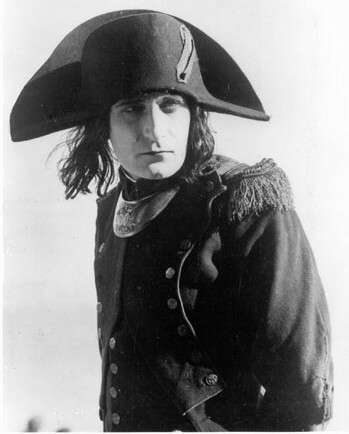 — I saw bits and pieces of Abel Gance’s NAPOLEON and heard even more from the next room. I watched carefully the scene of Napoleon at sea intercut with the revolution’s assembly turning on the Girondists, Napoleon accepting the revolution’s leadership, and the final “Polyvision” entry into Italy. I need to see the whole movie, plus Gance’s other work (I know I have LA ROUE and I think I have J’ACCUSE), but Gance looks like the fawesomest silent director. He had a kinetic style quite unlike anything else in the silent era, coming close to the raw energy of a rave party or slamdance. The camera moves, but in a propulsive, fast way (not the smooth tracks of a Murnau, e.g.) but never loses coherence within a scene or avoids closeups or keeping people in the frame; Gance’s editing is just as quick and rhythmic and brutal; there’s also superimpositions of multiple images and visual metaphors like a guillotine dropping while the assembly is buffeted by the winds of history. The effect is an even faster-paced Eisenstein. (Polyvision was a mistake though, at least in terms of trying to create an artificial widescreen … you can see the seams at the edge of each frame). Carmine Coppola’s score is a bit repetitive (“La Marseillaise” is a great tune, but not half-a-dozen times), but it clearly is in awe of NAPOLEON as the Great Man. Coppola’s score is boldly, extravagantly Romantic in its heroic idolization of the man whom Hegel, upon seeing him ride through Jena, called “the World Soul astride a single horse reaching across the world to rule it.” Indeed, I wondered how much of the “Gance’s NAPOLEON is fascist” talk in the 80s and 90s was really a reaction to Coppola’s thundering score. — The start of Tarkovsky’s SOLARIS hooked me again. I don’t know why it has such a bad reputation. Of course it’s talky, but it’s basically a thinly veiled Communist “show trial” in which atheist science reduces, represses, silences and hegemonizes religious experience. You can’t “dramatize the ideas” in a trial scene because the speeches ARE the drama. It was a theme clearly dear to Tarkovsky’s heart, and central to his ouevre and this film as well. Note how, in the clip below, the atheist interrogators look into the camera, addressing their reductive pettifogging to the auteur and to the audience; meanwhile Burton the astronaut, trying to explain the inexplicable, never does that. He is always looking somewhere off camera, knowing that this is not communicable.